The ASR-10 SCSI and digital option boards are becoming very difficult to find. I thought I’d take on the task of reverse engineering them and creating new ones. The SP-3 and the DI-10 are both completed now and are for sale. The DI-10 has issues when installed in a rack ASR-10. What happens is the digital output, over time, will become noisier and noisier, and will eventually be nothing but white noise. I’ve determined that it is an overheating problem but haven’t found what part(s) exactly are at fault. Looking at the signals on the ‘scope, I can see that the relationship between the serial clock, serial data, and sample clock change over time. I suspect that this problem may be a factor in the low sales of the DI-10. It may be possible to solve the problem by either putting a stick-on heatsink onto the overheating part, or installing a cooling fan. Or, leaving the lid off the ASR rack. Original SP3 (left), new version (right). SP-3 and DI-10 installed in an ASR. Hi! I just saw the page on the reverse engineered SP-3 board. I’m just wondering how close you are to releasing them, and what the cost would be. Also, does it have any upgrades from the SP-3? I bought my ASR-10 in 1995, and I still love it, except I never got the SCSI upgrade. They are still pricey and getting more and more rare. I’m trying to build a live electronic music show, and the ASR-10 is my central master controller, but I only load a few small-sized instruments on it. Thanks for taking an interest in the ASR-10! I have had the boards available for a while now but haven’t promoted or advertised them. I am selling them for $249.00 plus shipping. I also have the DI-10 boards available for $199.00. The boards are as close to the originals as possible, except where the parts were impossible to get. The changes made are mostly replacing through-hole components with surface mount versions. I also have the SP-2 interfaces available for the EPS-16 PLUS for $149.00 if you know anyone that needs them. All of these boards come with the necessary hardware and cabling. can i get DI – 10 board for my asr 10 ? Pardon my ignorance but what’s the difference between the SP-3 and the DI-10? 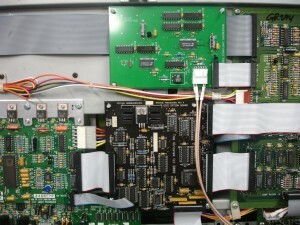 The SP-3 is the SCSI option board for the ASR-10. The DI-10 is the digital I/O option board for the ASR. Sorry, I’m still confused. So would I need both to rig up a SCSI drive? Or is the DI-10 for the audio input? Thanks Tom for helping to keep these awesome machines alive. You just need the SP-3 to hook up a SCSI drive. The DI-10 adds SPDIF digital I/O if you wanted to record or output digitally. You can have one or the other, or both, depending on your needs. i could not believe my eyes when i saw this new SCSI-board for the ASR. We have lots of ASR in Germany, all without SCSI. Please tell me, do you have, will you send to Germany, how much will it be? The German customs always make trouble and want to see a bill for their duty calculation. Maybe we can avoid this somehow. You have to advertise, because within some years the ASR will be the most valuable vintage sampler. Do you have a purple display ASR with SCSI in stock? Hi Marko, thanks for the comment. The SCSI board for the ASR-10 (SP-3) is available for 249 USD plus shipping (approx. 15 USD to Germany). I realize it is not inexpensive, that is due to the fact that there are a lot of components and it is time consuming to build, also a custom metal plate for the SCSI connector has to be manufactured. To solve problems with customs, I usually declare a lower value for the shipment (usually 30 USD). I don’t have any purple screen ASR’s but I do have three ‘old style’ ASR that are fully expanded with SCSI and Digital I/O. Hello, very pleased to see you have made a near-clone of the original SCSI board. Have you found no issues as of yet with this board? You mentioned a big issue with the digital outputs you made, just checking the SCSI board is good to go. If you can do the same thing for sending to London too that would be great. No issues with the SCSI board (that I’m aware of). The problem with the digital outputs is related to overheating of the main CPU board (not the digital I/O board), which I hope to solve with a heatsink once I determine what components are overheating. Hi all, I just received and received Tom’s SCSI board (new version) for ASR-10. It works flawlessly, installation is easy and Tom supplies it with the necessary cables. I have currently installed a 2GB SCSI IBM disk on ID:0 and a SONY CDU-76S CD-ROM on ID:4. I have transferred the system from Floppy System Disk to Hard Disk, so ASR-10 now is booting from the Hard Disk. Congratulations Tom, keep up the good work !! The ASR-10 has quite a bit more circuitry which is related to the direct-to-disk recording. It looks like the SP-4 is quite a bit simpler. Not knowing how the SCSI controller is hooked up to the TS, I’d have to have a board to reverse engineer it. I would like to know how much costs the SP-3 and the DI-10 and how much cost to ship them in UK. I bought an ASR-10 from eBay and I would like to update it to 2013. I would really appreciate if you can give me some information about it with exactly what I need for it (links with names and especially images will be great, as I am not a professional in this direction). I want to use the machine for sampling and I heard that it needs SCSI board upgrade, RAM upgrade, external HDD, Floppy, etc. and I think you are the perfect person to help me in taking a great decision. I understand and I appreciate the fact that your answer was prompt and essential. I would like to know which one are the greatest when you make music and you want to sample it? Any information will be more than great as I am not having knowledge in this direction. The FlexiDrive looks like a cool product, although it is expensive (almost $400). If you’re not going to be using floppy disk images then it’s not really necessary. SCSI is faster and with a CF to SCSI device will allow you to use memory cards as well. Upgrading the memory to maximum (16MB) is recommended, and fairly inexpensive. If you’re not using a digital source to or from the ASR-10, then the DI-10 isn’t needed. The DI-10 also only works at 44.1kHz, just so you know. Brilliant answer and very clear. Besides that , you never know when you need the floppy as well. About the DI-10, I am not sure if I will not use a digital source (as I am not sure if I will use the floppy again), sometime is good if you have it. One of your old comments says that the DI-10 is starting to increase the noise as time went on. Let me know if you have found and fix the noise problem. Thank you so so much! And please let me know if I bother with something! This project is a blessing for people who bought (or already have) the Ensoniq ASR-10 and want to update it! I’m sure that they are looking for information and components which are nowhere to find on eBay or somewhere else! Respect for your promptitude & amiability. The SCSI card is not to difficult to install. It involves removing the bottom cover, installing two plastic snap-in PC mounts, removing 1 ribbon cable, installing the board, and then connecting 3 more ribbon cables and installing the new SCSI plate. The noise I refer to with the DI-10 is the result of the drift of the internal sample clock due to overheating, which occurs with the rack ASR-10 but not the keyboard. It’s a problem with the ASR-10 main CPU board, not the DI-10 board. I hope to have a solution in the near future. I understood how to install the SCSI card and I thank you for that. I got to mention that I have the ASR-10 keyboard (rear), not the ASR-10 rackmount version. Which one needs a better solution for the DI-10? Thank you for making me understand this issues, I really appreciate! The arrangement of the PC boards in the rackmount ASR-10 causes a lot more heat buildup, and because of that, the sampling frequency will drift over time to the point where the DI-10 won’t function. The keyboard ASR-10 has the PC boards arranged differently and does not heat up the same way. So the DI-10 can really only be used in the keyboard ASR-10 at the moment. Clear. Thank you so much! I will speak more with Jammie about it! Kind Regards and Keep in touch! Could be a bad power supply. If you replaced the floppy, it has to be one compatible with the ASR-10, a standard PC 1.44MB floppy won’t work without modifications. A floppy emulator may work, contact Garth at Rubber Chicken Systems. He may have more information. Use the contact form and let me know what you want to purchase and your PayPal account. I own both an ASR-10 and an ASR-88. With my other gear, I am looking to downsize and am conflicted about which to keep. My ASR-10 is pristine but has no SCSI or DI/O. The ASR-88 has SCSI but no DI/O. I have been reading about your efforts and appreciate the fact that you are working to keep this amazing board active. I am interested in potentially a SCSI kit and/or the Compact Flash-SCSI upgrades. I am not sure I fully understand the benefits of the DI/O. Any help you could relay would be appreciated. Also, I am trying to backup my CDROMs and run everything on Macs. Any thoughts on how to best create duplicate CDs and to transfer disks to CDROM or HD. Have you considered upgrading the ASR-10’s memory capacity? I heard this is a challenge because it would require a different power supply and that the system is not designed to recognize more, but is this addressable? Who wouldn’t love to boost their ASR RAM to a few hundred MB or even a few GB! Just to be clear, I understand you are selling SCSI boards and DI/O. Are you also selling Compact Flash drives? Lastly, are you offering any bundled discounts on the items? i ve a SCSI installed but somehow it stopped working a few years ago. It does not give an error. It just does not find the connected drive. Not while booting nor with the command for manual changing the SCS ID. Any tip? Do you think if i by a new one from you it might work again? My ASR is one of the first ever build. It has wires all over the mainboard and was upgraded by myself with the SCSI Kit when it was available. The ASR Service Manual says “Make sure the EPROMs are v1.50B or higher”, but my ASR-10 has v1.50. Do you have any clues where to find these? Secondly, I’m thinking about mic preamps with internal A/D and s/pdif to use as the front-end for sampling. Some preamps output 24 bit spdif. Assuming 44.1kHz, do you know if the DI-10 will work happily – i.e. truncating to the highest 16 bits? 1.50 and 1.50B may or may not be the same. I have both sets so I can compare them. As for truncating to 16 bits, I’m 99% sure that the ASR does it. I use a test generator with a 24 bit output to test the DI-10 boards and the distortion figures are reasonable considering the truncation. Thanks Tom. I will wait for your findings on the ROM version question. My ASR-10 diagnostics screen (CMD ENV1 > SOFWTARE INFORMATION) reports ROM version “1.50”. But when I removed the basepan to look at the main board, the labels on the EPROM chips state “1.5B”. Hope this helps anyone else reading my question! Are the scsi boards still for sale, and ive seen that you sell 3 asr with the spyrus. Is one the spyrus available seperately? Hi Markus, thanks for asking but I’m not planning on selling the Spyrus separately. I have a ASR-10 and was wondering how I can get the most efficient hard drive that is compatible with it? Also how can or who services the upgrades. Solutions for the overheating problems? I have one with on board SSCI. Probably the best solution is a SCSI to Compact Flash drive. Fast, no moving parts (other than the cooling fan). Media is cheap and removable. I service the upgrades that I build myself, other than that, Rubber Chicken Systems might have contacts for repairs and modifications. Are you using 16MB of RAM? An overheating cause that goes unlooked is actually stated in the manual. When installing RAM you must use “Macintosh type RAM” and must be the “NON-PAIRTY” Not the “Pairty” IBM kind. Your second option, some say remove the RAM door and use a keyboard stand that does not cover the base. This can help heat dissapate faster. Being that heat rises, the best idea would be to completely dissamble the unit, and in the top of the case (ASR Logo area) you could drill many holes. This would allow that heat to travel up and out of your unit. It may seem like a difficult task, it depends on your level of comfort. The unit must be emptied from the shell before drilling. You dont want to drill into any parts. A small table top fan behind the unit (where the power cord goes) can also help keep the tempture down as the heat going into the metal, it can dissapate faster and bring down the internal tempture. I am sorry, I forgot to respond to your question of how to service your unit. You can find the factory service manual online for free in PDF format. Otherwise if you are not comfortable, a good idea would be to call electronic repair shops, tv and radio repair shops, things of that nature and explain to them what you want to do, ask if they have expeirence with vintage keyboards or audio gear, and see if it is something they can do. Fantastic work on the two boards. I saw someone in the comments asking if you planned to reverse engineer a board for another unit, but you needed a board to do so. I just ordered a new main board (Digital Board I believe its technically called) and if you ever had plans on re-creating them (ASR-10) I would be more then happy to donate mine. Altho I currently do not need an SCSI or DI/O, I love seeing what you have done with your boards, and if there was any way to help for the sake of apperciation, I gladly would. Hope all is well for you, and fantastic work! Thanks! I haven’t planned on making a new main board for the ASR, as it uses a number of (now-impossible-to-get) custom chips. Plus the sheer complexity of the board would probably take me well into retirement age! I believe the board in question is the SP-4 SCSI board for the TS series…It’s actually a much simpler design than the ASR SCSI board as it doesn’t have any of the direct-to-disk hardware. One line is missing from all of the 14-segment number characters across my display. Could this be fixed by replacing the MM58241N or is the actual VFD itself in need of replacing? Do you sell replacement new displays? If the same segment is missing from a number of characters, it’s possible that a new driver IC may fix it. The VFD itself could be bad, as well, or it could be a solder problem on the PCB. Unfortunately I don’t sell displays, perhaps The Soniq has some replacements. I replaced the MM58241N display driver and the issue remains. Thanks for replying. I’d like to buy your EPS16+ SCSI card when I can afford it. How much would the EPS16 SCSI card + shipping to England be? 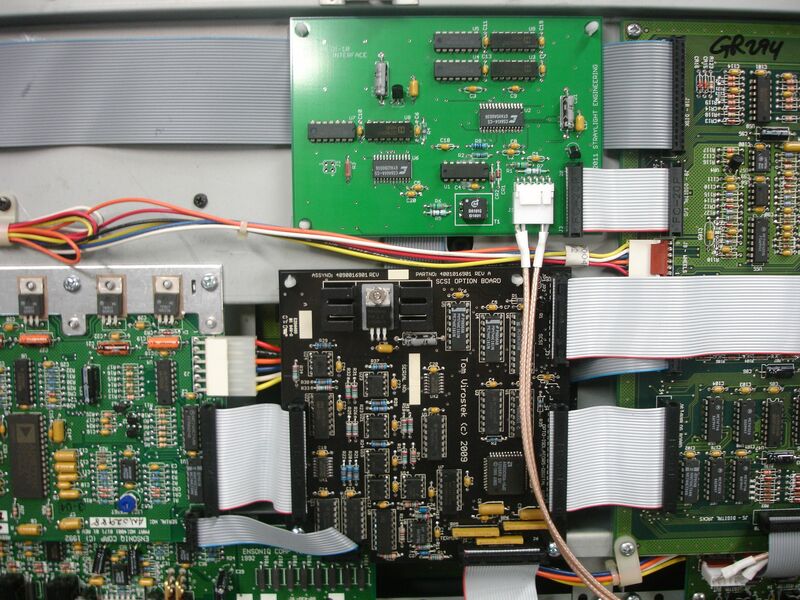 Nice work on your reverse engineered boards for the Ensoniq ASR-10. I live in Australia so please indicate the shipping cost. Just purchased a DI10. The transaction went super smooth. Installation was straight forward and my ASR10 immediately recognized the reverse engineered digital card. Now I’m transmitting that asr goodness over a lossless digital signal. Instant dope! Keep up the excellent work and thanks again Tom! So happy there is a site for this keyboard. I gave mine to my cousin many years ago and we are trying to revive it. The internal floppy is accessing but does not load operating system after sending for new disk. We have SCSI and a CDROM drive but the rom drive is questionable. Not even sure if the SCSI will work. We do not have any CDs for the CD Rom and no SCSI terminator for the through port on the CD Drive. Do you have a SCSI device we can purchase or is there a fix I can attempt on the Floppy drive? For now I would be happy just getting the floppy drive to work or confirming absolutely the Floppy drive is dead. I don’t have anything I can sell you unfortunately; you may want to look into a CF to SCSI drive (like the Aztec monster on eBay). New floppy drives are also available on eBay. It may be worth opening the unit up and checking / reseating connections. I have found the interconnect wiring in the Ensoniq gear to be suspect due to low quality components. This includes ribbon cables, molex connectors, IC sockets…etc. Oh by the way forgot to let you know we have an ASR-88 Keyboard. You know what I am really after is the Sequencer. I know there are a million other great features of the ensoniq but I have never found in software or hardware a sequencer that is so easy and quick to use. It does not interfere with the creation process. Do you know of any other instrument or software package that has the same exact method for sequencing as the ensoniq? Here is why I loved it. Hit Play Record at the same time. Play notes. Hit stop. Hit playback and hear what you just played in a loop. No having to set anything. Music you already played plays back and is looping so very easy to add to. Length of original 8 bars is not changed. When done they both playback at same time. So Simple, So user Friendly, So Easy. If not perfect quantize and the notes gets pushed to where they need to be. No thinking involved. No knowledge of music theory or notation needed. I have not been able to find any sequencer even close to this. They all require Logic and interruption to set all the parameters and make sure everything is correct. Has anyone found a sequencer that is for the mac or pc that emulates almost exactly as the Ensoniq does it?? Please let me know. I have some technical questions about using an external memory to eps or asr 10, for example a hard drive or card reader to the scsi. I’ve read that the eps or asr10 only can r e a d from external hard desk or card reader, but not save directly to them from the synth, as you save them to a floppy. You have to save the files from a computer, and for that needs some special software. Is this correct? I have also read that the eps or asr10 only can read and find 780 mb, and that is as much as a 700mb floppy – and therefore is is a waste to have an external memory bigger than 1G..? And Therefore should it be better to use several hard drives or card readers. What’s the point with use an external memory then, if it just not more than like a very big floppy? I’m not sure where you are getting your information, but both the ASR10 and EPS16 can read and write to SCSI. As far as storage size, I’ve used 2G flash memory cards without an issue. There is a formatting issue where the ASR will timeout after 2G or so, but after a power cycle the disk will be usable. I stumbled upon your website after discovering a comment left above that describes the exact problem I’m having with my newly acquired ASR-10 rack. Upon booting the unit, I was only able to see the “Searching for SCSI Dev” a few times after removing and reseating the very top SCSI connector after lifting the top off. ( SCSI J4 ). The SCSI wasn’t working before, so I reseated the J4 connector. Then after moving the sampler around, mounting it on a rack, the SCSI suddenly stopped working. I then open it up and reseated J4, but no go. So basically, the SCSI installed has somehow stopped working. It does not give an error and it of course can’t find any of my previously working connected SCSI devices. As noted, it’s no longer showing SCSI installed or searching for devices. The SCSI ID’s are appropriate. Fuses are healthy and have been checked for continuity. I have used several different working OS versions with same results. Firmware is 1.50. My last resort is to open it up again and start checking for continuity with all of the SCSI connectors connected to the SCSI board. Just thought I’d write a note here in case others encounter a similar problem. Final note. With floppy, the ASR-10 Rack works flawlessly. I have been able to sample, edit, and save everything so far. Yes, it heats up nicely but I don’t use for more than 2 hours at a time. The ASR really functions beautifully with the exception of the SCSI. Thanks very much! I’ve found that the factory installed ribbon cables can be faulty. If it’s only intermittently showing the presence of the SCSI card, try replacing the 26- pin ribbon cable that goes from the mainboard to the SCSI card. Update! Thanks again for responding to my previous comment. Unfortunately after replacing all fuses and connectors to the SCSI board, I continue to experience the failure of the ASR-10 rack to either detect the SCSI board or search for devices. Perhaps I may need to just make due with the working Floppy drive until I can replace the SCSI board which is fine for now. If you ever have any available SCSI boards, please let me know on how I can contact you for purchase. Thanks again and have a great week. Hi Tom, can you build something working as a SP4-SCSI kit for my Ensoniq TS12? Can you ship it to Italy? HI Tom. I have an ASR-10 Keyboard without the SCSI. I just want to be able to interface to my computer and be able to use studio software and also burn CDs if possible. Can you tell me exactly the correct items i need for that? Would sure appreciate it. Still making/selling these scsi boards? I still have them for sale. I was trying to upgrade my ASR-10 from floppy to SCSI-SD.. Do you have anything that would help me with this upgrade? Thanks. You will need a SCSi board if you don’t have one already (obviously). If you are planning on mounting the SCSI2SD internally the terminators on the SCSi board will need to be removed. You will have to figure out the SCSI cabling as the board has a 26-pin connector and the SCSI2SD has a 50 pin connector. An adapter board is probably available to accomplish this. You may need to add a power harness for the SCSI2SD. If you are removing the floppy drive you can use its power connector by way of an adapter cable. I sell the SCSI kit but the other items you would have to source yourself. Is the DI-10 is available? Okay Tom, i just purchased my ASR 10 (wanted for years), the floppy is fun, in an old school kind of way, but I do want the option to add a zip or other external drive. Is the sp3 the best option for this? I can’t find a scsi card for the asr 10 anywhere. FYI to everyone that wants to order a kit: Send me a message (on the Contact page) with your shipping address, what you want to purchase, and PayPal email address and I’ll send you a PayPal invoice. I currently have 10 SP-3’s and 2 DI-10’s left. The EPS SCSI kits are sold out as are the DSS-1 kits. I also have about 20 of the 5530 modules left too. Hey Tom. I just bought an ensoniq without the scsi board. Are you still selling these and if so, how much? Hi! Just wondering if you had any Asr-10’s for sale? Really struggling to find any where I’m from in Canada. Thanks for your time! I have 2 ASR-10’s with scsi drives. Are you still looking for one? Just wondered if the SCSI kit for ASR-10 is still available, how well it works, what comes with the kit, and any other details you can give me about this. And thank you for taking an interest in this awesome sampler/workstation. I was very disappointed when Creative bought out Ensoniq and then basically killed their product line. The kits are all sold but I will do another run of them once the EPS16 boards are done. hia tom, how can I know when the scsi cards will go on sale?
? I have an ASR 10 keyboard, but it does not have scsi board, and I need it!!! This is outstanding mate! Thanks for your knowledge and time to make these for our beloved ASR-10! I’d be very keen on the two ASR boards if they are still being produced. Happy to pay in advance if needed. Please let me know when the ASR-10 SCSI boards are available. I’ll post it on the site when they are available. I have 2 ASR-10’s with SCSI drives and disks, etc. They have not been used in several years. They are for sale if anyone is interested. do you still have one of the 2 scsi’s ? I was going to see about reverse engineering the purple screen ASR’s and make it available as a retrofit, but haven’t had the means or the time to get a purple screen keyboard. EDIT: I now have a purple screen ASR-10!! As I suspected, they added a second micro controller (a 68HC11) to take the data stream from the KPC and convert it to commands for a 240X64 LCD. Time permitting I should have a solution this year sometime. Wow… this is an amazing feat you have pulled off reverse engineering these boards, I grew up making all my music on the eps 16+ and later the asr10s . With all this knowledge, are you able to make these samplers run reliable without all the errors. I especially became really good with the sequencer but it just kept crashing and eventually I phased it out and started using other gear. I still have my eps16+ but its in parts as it won’t calibrate on startup correctly, think its the keyboard controller board. Maybe heat really was a factor for errors as I remember these units were always cooking hot. Thinking about getting an asr 10 and would love to a purple screen, I will keep an eye on this site. It would also be great if you could do a purple screen for the TS-10 but they will likely have a different data stream compared to the ASR. Might be too hard if you need one to work from especially considering how rare the TS-10 Plus is.